Flooding is one of those things around here. There is no rain, and then, in the space of a few hours, there is far too much. This is not the flooding of the Mississippi that lasts for weeks. Here, it lasts for hours. All the same, it does wreak havoc, and you need to make sure any place you settle/buy is not in a flood zone. The weird guy never did anything, right? I used to walk "home" after a night of tangoing in the pre-Uber days, when there were no cabs to be found in Paris after midnight (and no Metro). 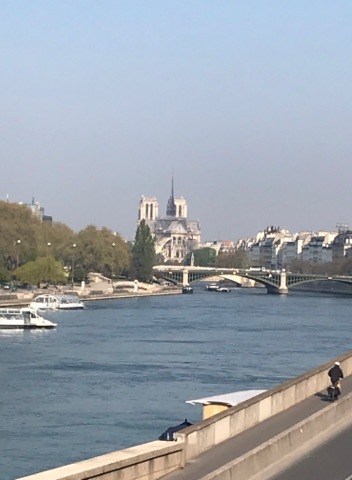 I would walk from the Left Bank to Montmartre, getting lots of offers for rides, which I would decline with a laugh, saying I had just arrived at my destination, which wasn't true but whatever. I never felt threatened. As for a touristy area, many French towns have this, with the soap shops and all. The worst, though, are the towns that don't. Saint-Rémy de Provence, for example: the whole place is perfectly restored and perfectly tasteful to tourists and also beyond the budgets of the young generations of families who have been there for centuries. I would rather be in a place that has its tourist center, as so many cute French places do (France is, after all, the #1 travel destination in the world), vs. a place where tourism has pushed out the locals, as in Aspen. Or a lot of Provence. I have been planning to post about safety in Europe and have been taking shots of elderly ladies, tottering about town with canes or walkers, and handbags dangling. To me, they are the canaries in the coal mine: that they, so vulnerable, feel fine walking about shows me that I am quite OK. Little kids, too. I see very young ones (6? 8? years old) running around the center of Carcassonne, unaccompanied. They head one way, then a while later, in the opposite direction, but carrying bread or something else. They were sent out on an errand. Alone! This should be normal everywhere. Let such old ladies and children be your guide. Ha! You are so funny. Loved this tour too. Francetaste, , I agree with your points about safety. That's why I said it is the only time I felt unsafe in France, except occasionally in Paris when Earl wanders away and strange men will approach me, probably in an attempt to scam me. And as far as the separation between the tourist and working class, maybe this city is more honest than others with the line fairly delineated. Thanks for your insights. Just Me, Thanks for coming along on the tour! And for commenting.